Sarah and I have had a few meetings with Blake and Larry since our last update. 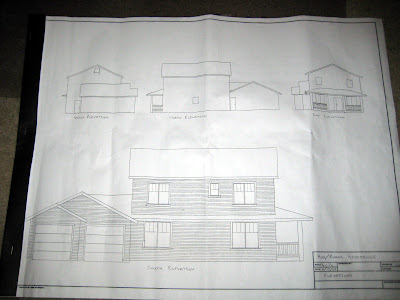 Above is a photo of Larry's exterior drawings. You'll be happy to see that we have windows and doors! We have already made changes to the southern windows on the first floor, along with a few smaller changes inside the house. 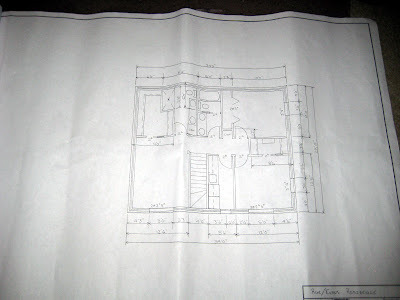 It's not indicated in this drawing, but we plan to install a metal roof. Metal roofs last much longer and work much better with photovoltaic installations. If we harvest rainwater, the water we collect will be much cleaner than that from a composite shingle roof. And if you select the right colors, they look great, too. This second photo shows the first floor. 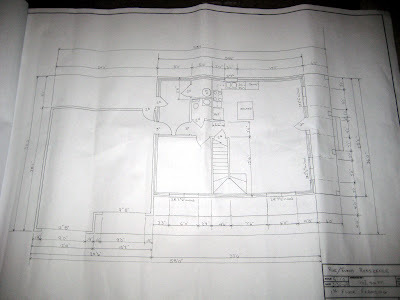 You can see we've pushed back the west kitchen wall and drawn in a sample kitchen layout. Notice the sweet kitchen island. Jealous? The bathroom and mechanical room have been slightly reconfigured, and will probably undergo even more changes. Also notice the stairs now have a 180-degree turn (before they were just an L shape). The office is still huge (yes!). And finally the garage has even more room for storage, though we might have to cut it back a bit depending on how much it encroaches on the backyard tree's root system. The final photo shows the upstairs. As you can see, we (by "we" I mean Larry and Blake - they rock) have completely redesigned the layout. To allow symmetrical front windows, the smaller bedrooms were moved to the front of the house. This still gives us a walk-in closet and bathroom in the master suite, an upstairs laundry room, and a full secondary bathroom for kids and guests. Note that one person can be showering while another uses the sinks in the guest bath. Privacy! There will be a few more windows in the final design than shown here: one west-facing window in the master bedroom and a north-facing window in the north kids room. That way the two smaller bedrooms have basically the same features. Even with all these changes, the layouts continue to maximize the use of the space, with very little wasted on hallways. The plans also show how thick we think the exterior walls will be - 10 inches! We're probably going to use a "double-studded" design, which is basically two walls right up against each other with staggered studs. This prevents thermal bridging (all the empty space is filled with insulation, and there is no direct non-insulation path from one wall to the other), and keeps us nice and toasty in the winter. Today we got initial early estimates on the construction costs, and everything is within the expected range. The budget includes a solar thermal water heater, a sizable photovoltaic system, hardwood floors, porcelain tiles in the bathrooms, fancy carpet upstairs, custom cabinetry (kitchen and built-ins throughout), and tons of other great stuff. Of course, a lot can still change, but so far everything is going according to plan. Hopefully we'll be breaking ground in two months. Looking good! Thanks for putting the latest and greatest out for us to see. The house will be soooo great. Keep the updates coming!